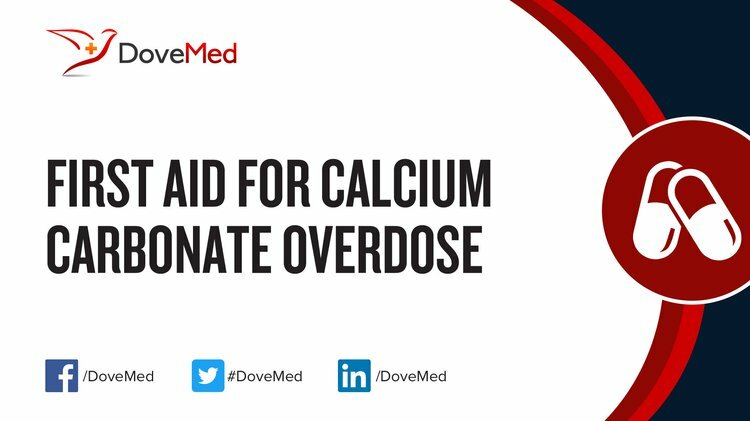 Calcium Carbonate Overdose is the accidental or intentional intake of the drug in dosage higher than prescribed values. What is Calcium Carbonate Overdose? What are the Causes of Calcium Carbonate Overdose? What are the Signs and Symptoms of Calcium Carbonate Overdose? The signs and symptoms of Calcium Carbonate Overdose can vary from one individual to another. It may be mild in some and severe in others. Several systems of the body may be affected. How is First Aid administered for Calcium Carbonate Overdose? Who should administer First Aid for Calcium Carbonate Overdose? First aid for Calcium Carbonate Overdose is administered by healthcare professionals. What is the Prognosis of Calcium Carbonate Overdose? How can Calcium Carbonate Overdose be Prevented? Dewi, A. H., Ana, I. D., Wolke, J., & Jansen, J. (2013). Behavior of plaster of Paris‐calcium carbonate composite as bone substitute. A study in rats. Journal of Biomedical Materials Research Part A, 101(8), 2143-2150. Al-Jandal, N. J., Whittamore, J. M., Santos, E. M., & Wilson, R. W. (2011). The influence of 17β-estradiol on intestinal calcium carbonate precipitation and osmoregulation in seawater-acclimated rainbow trout (Oncorhynchus mykiss). Journal of Experimental Biology, 214(16), 2791-2798. Singh, A., & Ashraf, A. (2012). Hypercalcemic crisis induced by calcium carbonate. Clinical kidney journal, 5(4), 288-291. Gunn, J. M., Rekola, J., Hirvonen, J., & Aho, A. J. (2013). Comparison of the osteoconductive properties of three particulate bone fillers in a rabbit model: allograft, calcium carbonate (Biocoral®) and S53P4 bioactive glass. Acta Odontologica Scandinavica, 71(5), 1238-1242. Foley, K. F., & Boccuzzi, L. (2015). Urine calcium: laboratory measurement and clinical utility. Laboratory Medicine, 41(11), 683-686. Dizaj, S. M., Barzegar-Jalali, M., Zarrintan, M. H., Adibkia, K., & Lotfipour, F. (2015). Calcium carbonate nanoparticles; potential in bone and tooth disorders. Pharmaceutical Sciences, 20, 175. Wagterveld, R. M. (2013). Effect of Ultrasound on Calcium Carbonate Crystallization (Doctoral dissertation, TU Delft, Delft University of Technology).